Mature acne should be addressed differently than teen and young adult acne, says Joel Schlessinger MD. As if fine lines, loss of firmness and dark spots weren’t enough, many adults are experiencing difficulties with breakouts as they get older. This common skin condition affects millions of individuals of all ages. Because there are hundreds of different acne treatment options, it can be difficult to determine which method is right for adults. Physicians and aestheticians can choose from procedures, treatments and products that eliminate bacteria and heal the skin. In this post, Joel Schlessinger MD explains how to treat blemishes that affect mature skin types. Joel Schlessinger MD and other dermatologists suggest treatments that address both acne and aging. Most patients with mature skin are looking for a treatment that addresses both blemishes and concerns such as loss of firmness and fine lines. As skin ages, its ability to turn over new cells decreases. This causes the complexion to become congested, dull and sluggish, which can aggravate blemishes. Increasing cellular turnover is an effective way not only to eliminate breakouts, but also to fade signs of aging. Dermatologists can perform laser resurfacing treatments that shed dead skin cells and allow the complexion to heal and repair itself. Joel Schlessinger MD tells aestheticians to recommend products that encourage cell turnover. Along with regular resurfacing treatments, a regimen of products that rejuvenate the complexion is a must for a mature acne routine. One of the best options is to use a product with vitamin A or retinol. These treatments renew the complexion and eliminate dead cells to fade fine lines, wrinkles and blemishes. 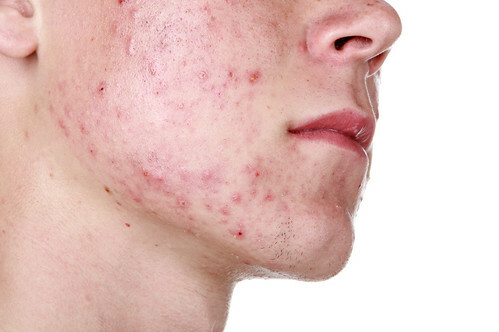 To read more about treating mature acne, read this recent article from Skin Inc. Plus, learn about specific ways to treat teen acne and young adult acne by reading Joel Schlessinger MD’s blog. What is microdermabrasion? Joel Schlessinger MD answers. Most people are looking for a spa treatment that reveals a youthful, radiant complexion without taking up a lot of their valuable time. Microdermabrasion meets both of these requirements and is becoming a popular choice among spa-goers. In this post, Joel Schlessinger MD explains how this procedure works and why this treatment can be beneficial for your complexion. Microdermabrasion uses microscopic crystals to exfoliate the complexion. This process removes the outer layer of skin to encourage cell rejuvenation and create a more youthful appearance. Joel Schlessinger MD reveals the numerous benefits of this procedure. Patients who undergo this treatment can expect a reduction in the appearance of outward signs of aging including fine lines and dark spots. After just one treatment, the skin texture appears smoother and softer. This procedure is safe for all skin types and tones because it is non-invasive and does not cause scarring or discoloration. You can receive a microdermabrasion treatment at the spa or in the comfort of your own home. An in-office procedure lasts only a few minutes and produces minimal skin irritation. After the treatment, apply a lightweight moisturizer and a broad spectrum sunscreen to protect the delicate skin. Instead of an in-office treatment, try these at-home products recommended by Joel Schlessinger MD. At-home microdermabrasion exfoliators can be used two to three times a week to rejuvenate skin and renew the complexion. LovelySkin Micro-Buff Crème helps fade signs of damage for a more youthful appearance. Another top-selling product is Clinicians Complex Microdermabrasion Cream. This scrub works on all skin types including acne-prone complexions, to eliminate dulling debris and unclog pores. To learn about more skin care procedures and products, view presentations on Joel Schlessinger MD’s SlideShare. If you have any questions, let him know in the comment section. There is a large variety of treatment options for skin cancer, including laser surgery, radiation and freezing. 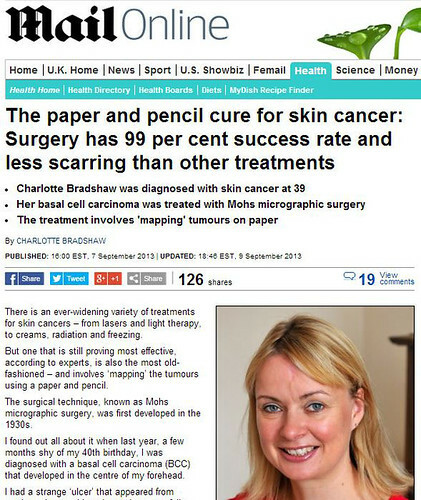 However, Mohs Surgery, developed in the 1930s, continues to be the most effective option for treating skin cancer. According to a recent article, this method offers a 99 percent success rate for basal cell carcinoma and leaves less scarring than other options. This procedure is also suitable for squamous cell carcinoma and certain forms of melanoma, but BCC accounts for 75 percent of all skin cancers. The article listed above highlights a woman who was diagnosed with BCC at age 39 and was unaware of Mohs Surgery until suggested by her dermatologist. It wasn’t until he sat down with her that she learned how the procedure works. It begins with the visible portion of skin cancer and a layer of surrounding skin being removed with a scalpel. The physician then maps the tumor on paper to serve as a guide to its precise location. The area removed with a scalpel is then processed with stains to highlight cancerous material before examining the tissue under a microscope. If cancer is still present, the physician will repeat this process until the cancer is gone. Some cases of skin cancer do not qualify for Mohs. These cases are treated with other options like a standard excision, radiotherapy, topical creams or Photodynamic Therapy. Radiotherapy uses high-energy rays to kill cancer cells from the outside. Topical creams work on the immune system to help the body fight back and Photodynamic Therapy combines a special cream with exposure to a specific wavelength of light. Topical options like these are only used for low-risk, superficial tumors. Do you have a question for Joel Schlessinger MD about Mohs Surgery? Share them in the comments. As a board-certified dermatologist and cosmetic surgeon, Dr. Joel Schlessinger is always looking for the latest skin care innovations. From high-tech devices to physician-strength formulas, he likes to offer his patients the best, most advanced treatments available. In a recent interview with Dr. Barry Lycka on WebTalkRadio.net, Dr. Joel Schlessinger discussed the newest at-home hair removal laser as well as a few of his favorite new technologies. Home laser hair removal isn’t just for fair skin anymore, Dr. Joel Schlessinger explains. As more women are looking for a way to stop shaving and waxing, the hunt is on to find an at-home hair removal laser that will work on any skin tone. Dr. Joel Schlessinger is very excited about the me smooth Hair Removal Device, which uses intense pulsed light and radio frequency to remove unwanted hair. As a bonus, this laser can be used on both light and dark skin. Learn about the latest skin care innovations from Dr. Joel Schlessinger. Dr. Joel Schlessinger says red and blue light therapy devices can also benefit the skin. Blue light is often used to treat acne and promote clear, healthy skin. The Baby Quasar Baby Blue Anti Acne Light Therapy, for example, effectively eliminates acne-causing bacteria on the face. Red light devices like Baby Quasar Plus Wrinkle Reducing Therapy treat photoaging to help you achieve a more youthful appearance over time. The bliss fatgirlslim Lean Machine is another device that is gaining popularity. It targets cellulite and firms skin using a combination of rolling, lifting, suction and pulsing motions. Dr. Joel Schlessinger says this device is popular among those who want a simple treatment at home without expensive trips to the doctor’s office. Do you have a question for Dr. Joel Schlessinger about the latest skin care breakthroughs? Let us know in the comments. Natural vitamins and minerals in pumpkins make them ideal for the skin, explains Dr. Joel Schlessinger. The scent of pumpkin usually inspires thoughts of autumn and the changing seasons. This amazing ingredient isn’t only reserved for the holidays, however. You can use this plant year round to maintain healthy and vibrant skin. In this presentation, Dr. Joel Schlessinger explains why this ingredient should be part of your routine. Pumpkin is rich in vitamins A, C and E as well as zinc, potassium, lutein and beta carotene. All of these minerals keep the complexion healthy and protect it against damaging free radicals that cause signs of aging. The antioxidant properties of this ingredient help you maintain a youthful complexion. Dr. Joel Schlessinger recommends using an exfoliating pumpkin product. The natural enzymes in this plant dissolve dead skin cells to create a soft and smooth complexion. This exfoliation also encourages cellular renewal and helps create skin that is youthful and radiant. If you are sensitive to harsh exfoliants such as alpha hydroxy acids, try an exfoliating product made with this extract. Pumpkin is also beneficial for anyone with acne-prone skin. The natural exfoliation process eliminates oil and debris within clogged pores. Masks and peels with this ingredient help reduce the appearance of blemishes, blackheads and whiteheads. Choose a pumpkin product recommended by Dr. Joel Schlessinger. There are a number of products containing this ingredient that create a naturally radiant complexion. LovelySkin Pumpkin Clarifying Mask and LovelySkin Pore Refining Pumpkin Mask both exfoliate the complexion to refine and nourish skin. For a more intensive treatment, try Peter Thomas Roth Clinical Peel & Reveal Dermal Resurfacer. This product combines pumpkin and alpha hydroxy acids to eliminate dulling, dead skin and encourage cellular renewal. Do you have questions about some of your favorite pumpkin skin care products? Ask Dr. Joel Schlessinger in the comment section. Sunburn is still an extremely common issue, reveals Joel Schlessinger MD. Nearly everyone has dealt with sunburn at some point in their lives, whether they’re trying to achieve a perfect golden bronze or they simply miss a hard-to-reach spot with sunscreen. This type of skin damage is extremely harmful and potentially dangerous so prevention is key. Here are some tips from Joel Schlessinger MD to deal with sunburn in case you slip up. When skin is exposed to UV rays, it produces excess melanin to protect itself. This process causes the complexion to turn dark brown and sometimes red, which is a sign of UV damage. Even individuals with dark skin tones or sun worshippers who never burn are susceptible to the harmful effects of UV exposure. Sunburn symptoms can be irritating and painful, says Joel Schlessinger MD. Immediately after too much sun exposure, skin will be painful and appear red or pink. A few days after the burn, skin will begin to peel and may become dry and itchy. Over exposure to the sun can also cause headache, nausea and chills. After your skin burns, Joel Schlessinger MD recommends staying hydrated and avoiding sun exposure. You can also take an anti-inflammatory medication such as ibuprofen to help relieve some of the pain. Joel Schlessinger MD also recommends applying topical products to soothe and calm skin. To avoid sunburn, you can take steps to protect yourself such as taking Heliocare Sun Protection Pills daily. These supplements build up your skin’s resistance to UV damage. You should also apply a product such as EltaMD UV Physical Broad Spectrum SPF 41. If you do burn, apply LovelySkin Aloe Vera Soothing Skin Relief Gel to replenish damaged skin. You can also use FixMySkin Healing Body Balm Unscented with 1% Hydrocortisone to heal dry, irritated skin. Which products work for you after you’ve spent too much time in the sun? Let Joel Schlessinger MD know in the comment section below!